News of events involving Prime Minister Yoshihiko Noda. In his speech at the presentation of letters of appreciation to Japanese who have made notable personal contributions to the international community, then Minister for National Policy of Japan Motohisa Furukawa spoke of these people having shown "passion without borders." This month's Cover Story introduces several such dedicated individuals and their work in a wide range of different fields. 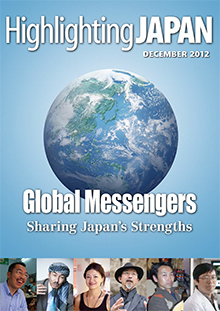 The Japanese working overseas profiled in these pages have won the deep respect and admiration of their peers. Learn about this traditional print art form and answer our quiz! Japanese researchers are developing a completely new method of power supply that combines solar cells with thermoelectric generators. Award-winning paper cutout artist Hina Aoyama produces works of astonishing intricacy. German monk Muho Nolke serves as the ninth-generation abbott of the remote Antai-ji temple in Hyogo Prefecture. Located close to Izumo-taisha grand shrine, Shimane Museum of Ancient Izumo is a treasure trove of remarkable archeological artifacts. On the 60th anniversary of the establishment of diplomatic ties between Japan and India, Ambassador of India to Japan Ms. Deepa Gopalan Wadhwa explains the nature of India-Japan relations today.